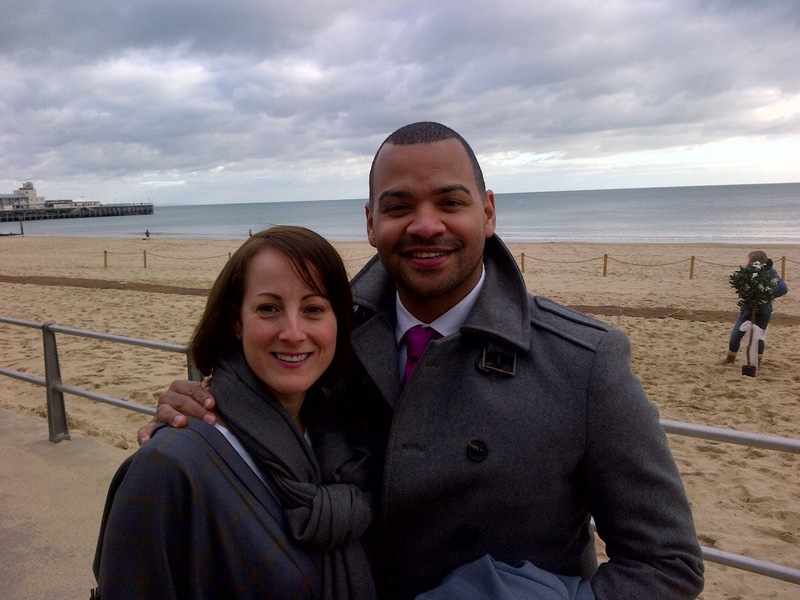 After hundreds of applications from couples who had a romantic story or a connection to Bournemouth these were selected down to the top 3 and their stories were each shown on the programme in April where the viewers could then vote for their winning couple. On 19th April 2012 Michael Underwood visited the home of Kate and Frazer live on Daybreak to announce they were the winners of the competition as voted by the public and that they had won the opportunity to be the first couple to marry on a beach in England and their wedding would take place a week later! So we began with the final week’s preparations for their wedding and with the weather not looking at its best for April we had our work cut out. 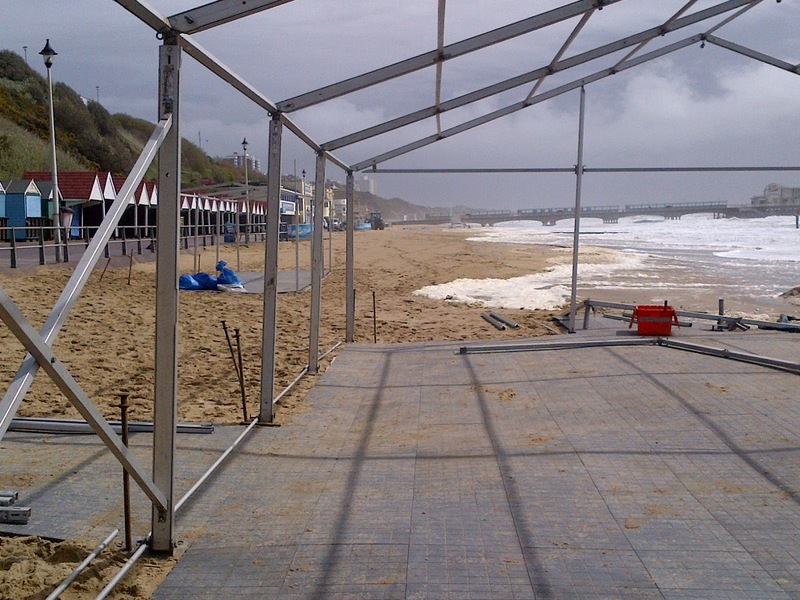 We have a strong and highly supportive team of suppliers and the way that our marquee based beach venue is organised we build everything for the worst case scenario with weather and if the sun decides to put in a glorious appearance we can easily take off the sides of the marquee to open it up but if there is a shower or windy conditions our marques can withstand it. 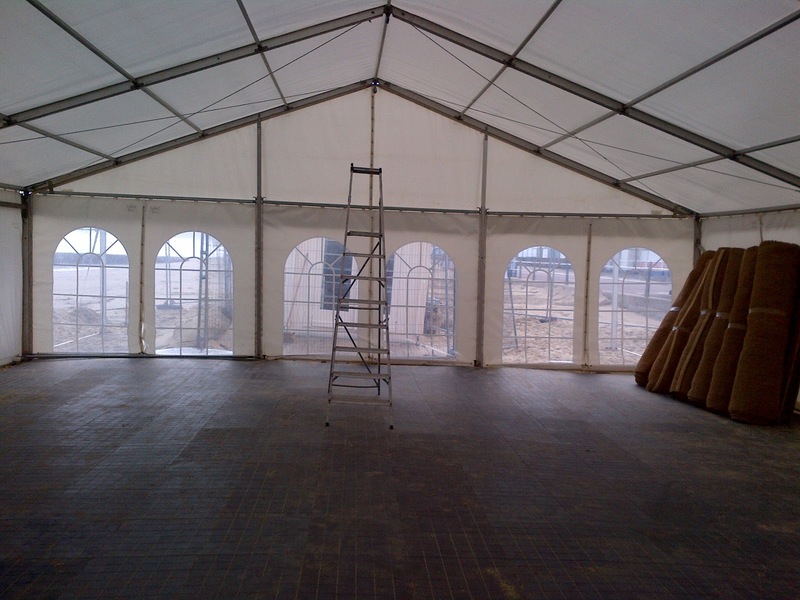 Now this amateur image taken on a Blackberry pre the start of the build of the marquee does not look all that fabulous does it! 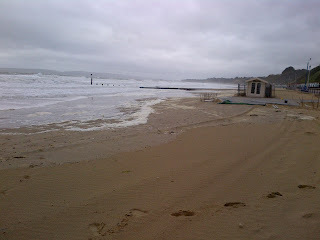 Well its purposefully included to show you what a transformation was created in some of the worst April conditions we could have imagined so read on! Midway through the morning of day one of the build the sea is still progressing far too far up the beach for our liking but the sun had decided to make something of an appearance. 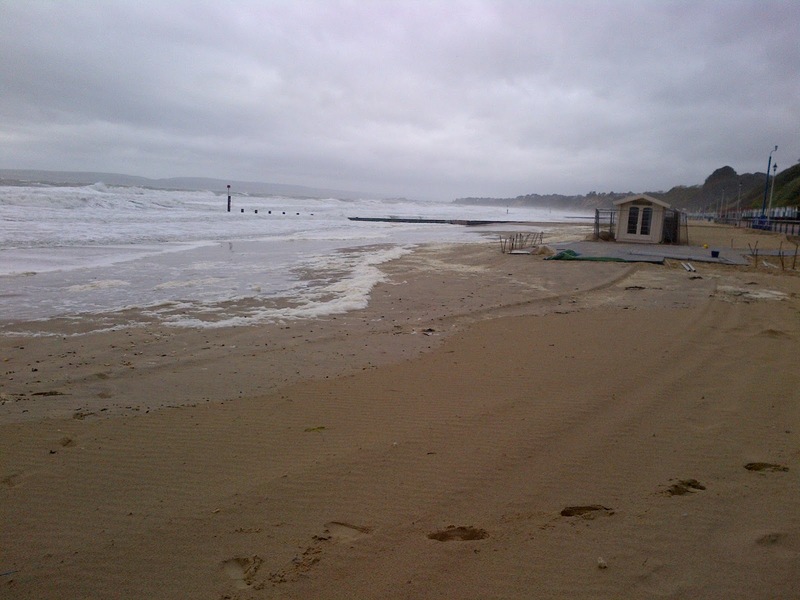 The marquee team from Maidmans Marquees were working very hard to get this job completed as were the Bournemouth Council Seafront team – building a little sand wall along side the marquee to help with some of the wind and sea which was coming right for us! So it was up! 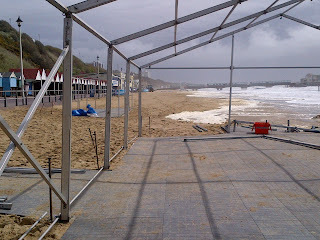 Against all odds the guys had managed to get the marquee up so then internal works could begin on day two for things to start to take shape. 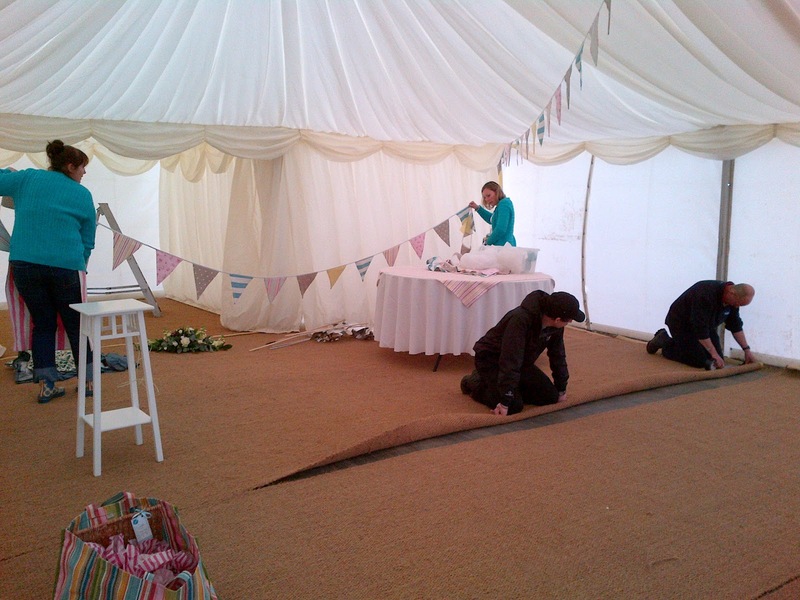 Linings go in next and then the coconut matting carpet overlay on to the hard all weather flooring – great for those ladies heels! Linings are up, bunting starts to make an appearance and the guys are putting the finishing touches to the carpet. 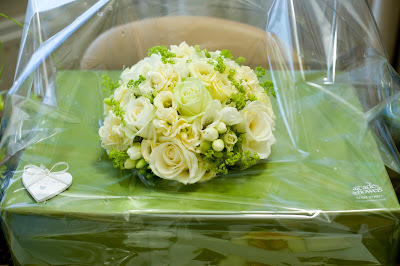 And then the floristry begins! Emma and Jenny from Arcade Flowers arrive to start working their magic with all things floral! Louise and Rachel from Coastal Creatives even managed to find time to squeeze in a coffee! 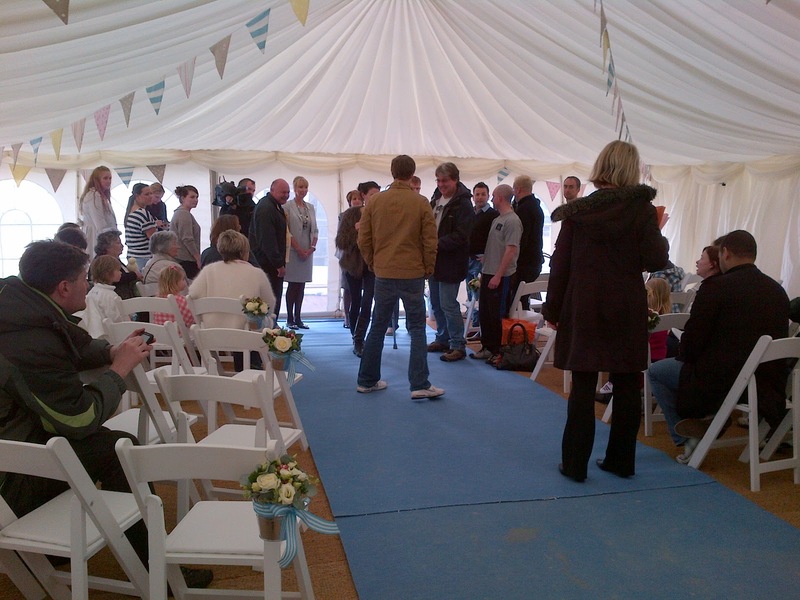 Our marquee company Maidmans Marquees who kindly supplied the marquee for the winning couple worked incredibly hard to ensure that the structure went up in the strongest winds. 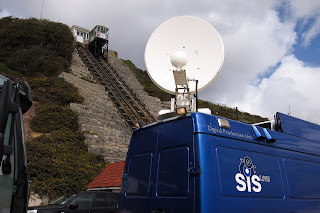 Working against all odds the team (kept happy with copious amounts of coffee, cakes and fish and chips late on Thursday night to keep them working!) pulled off this difficult job and made it look amazing. 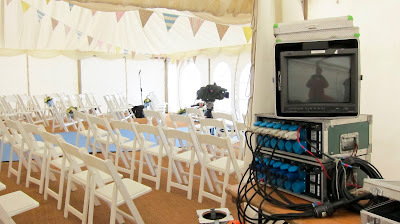 The wall of the marquee on the sea side was a complete window wall (as with all weddings) allowing a stunning view of the sea no matter what the weather. The rear of The Wedding Hut was enclosed last minute due to the unseasonal weather which would have prevented a clear sound signal for transmission of the ceremony live to the nation. 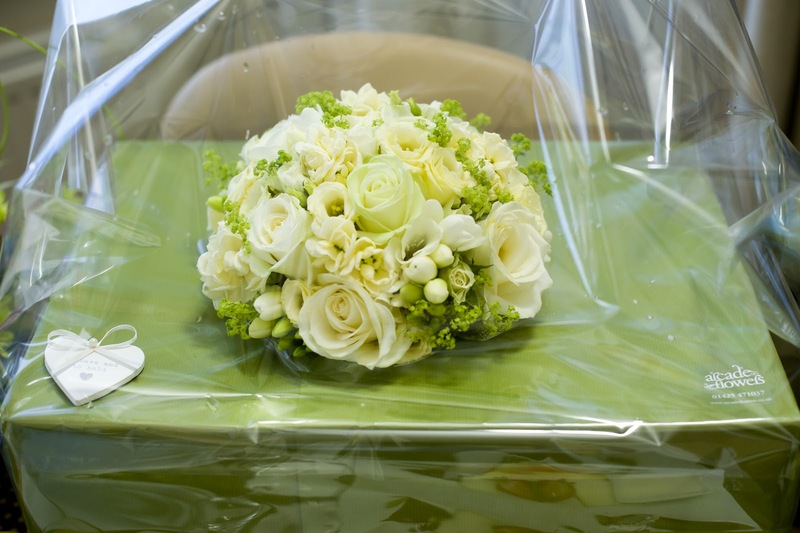 This is something that we can add in to couples wedding plans if the weather does seem to look difficult in the future as well. 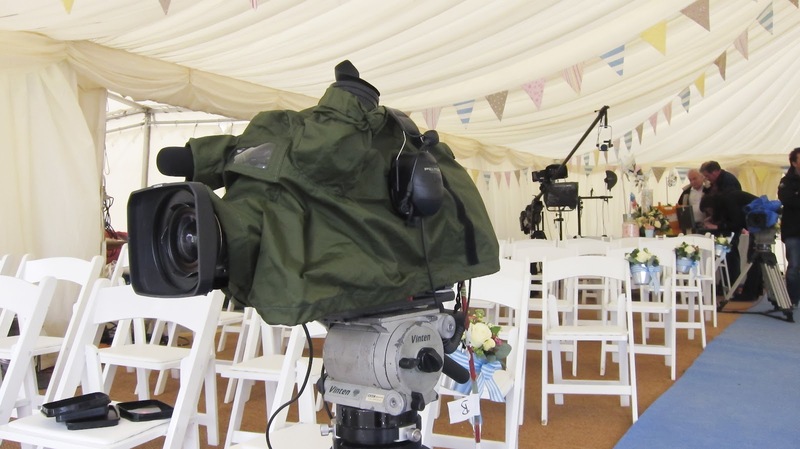 These are some images of how things were looking when the TV crews arrived on the beach the day before the wedding to set up their gear – and boy there was a lot of gear! 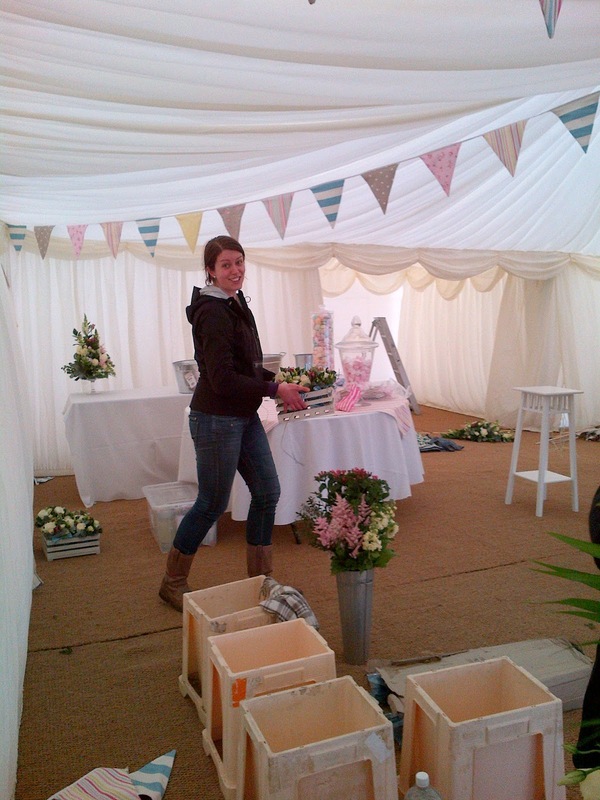 We cannot thank the team enough who helped put the marquee together and make it look beautiful who were Louise and Rachel from Coastal Creatives and Emma and Jenny from Arcade Flowers – both recommended and valued suppliers of Beach Weddings Bournemouth. 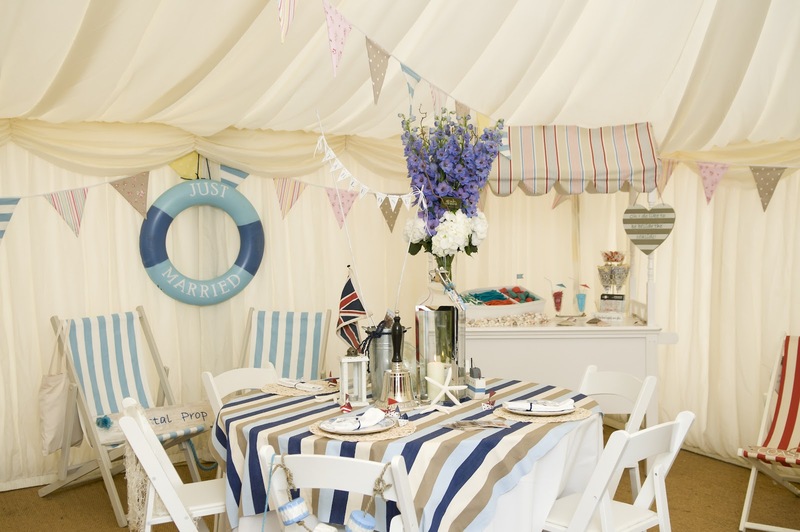 The design scheme for the marquee agreed in advance and created by Coastal Creatives with floral designs and creations from Arcade Flowers and this was The Great British Seaside with an elegant feel and use of pastel shades and soft English flowers. 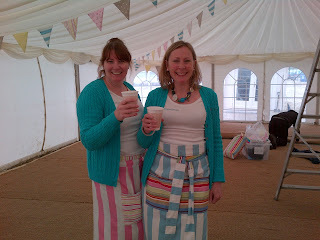 Louise from Coastal Creatives (with her Mum!) made metres and metres of stunning bunting which adorned the marquee and this was put up on the Thursday. 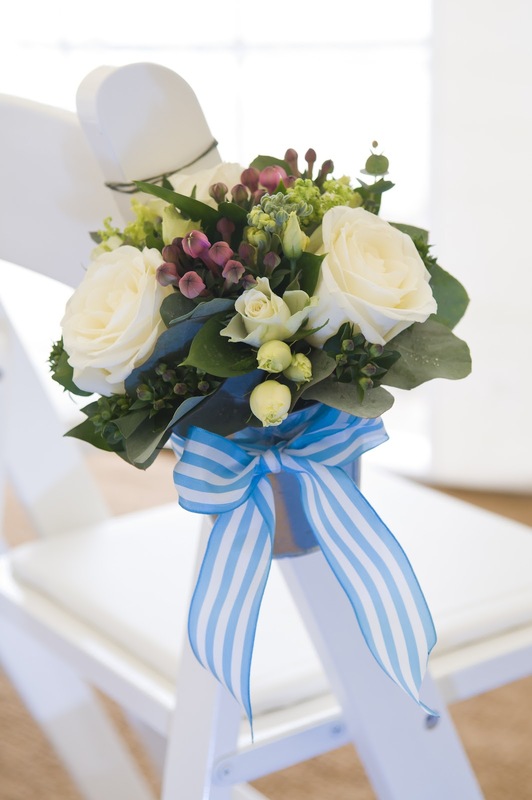 Arcade Flowers had worked incredibly hard to create the most stunning floral arrangements. The white wooden chairs had nickel bucket pew ends with stripey blue and ivory ribbons. 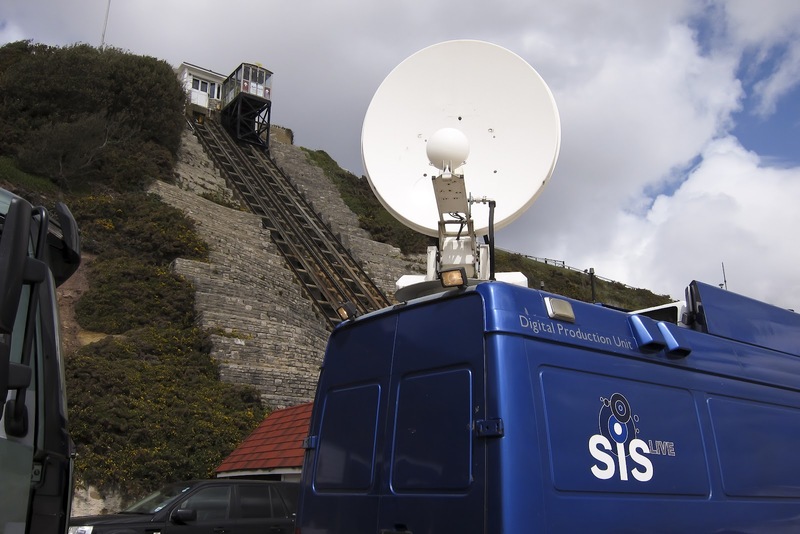 The front of the marquee and the top of the cliff lift had large versions of these buckets with large silver windmills and soft moundy flowers at the base to match the rest of the themes. 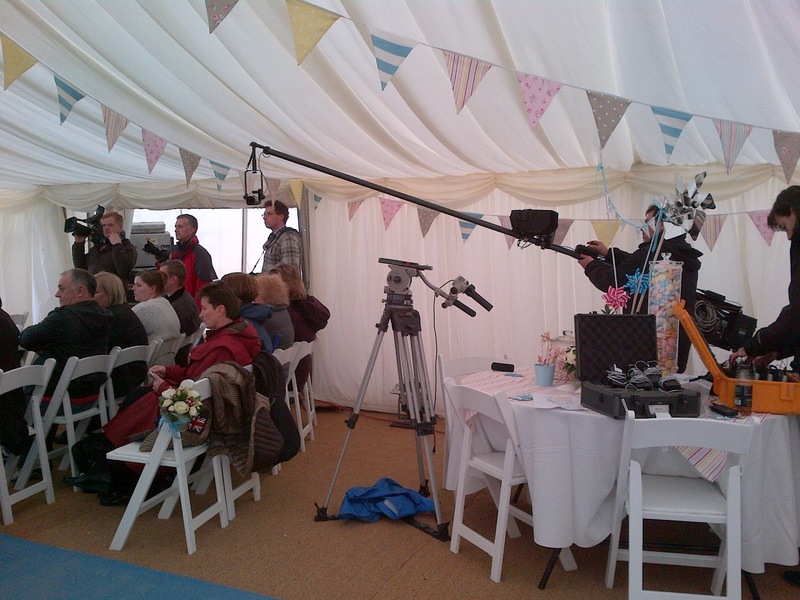 We had two tables dressed in the marquee for those guests who wanted to be seated after the ceremony to enjoy their canapés and champagne. 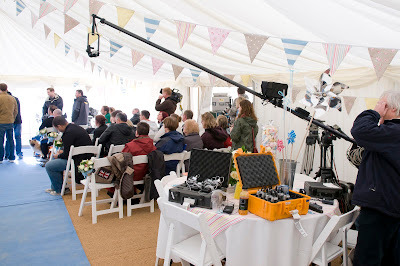 Coastal Creatives and Arcade Flowers did a great job in delicately yet effectively dressing these tables to match the overall design scheme of the marquee. Now, the brides bouquet (and matching smaller bouquets for the three Rachels / bridesmaids) what can we say – simply dreamy – well done Arcade Flowers for the most stunning creations known to man and these photos simply dont do them justice! We had a full rehearsal on the Thursday night with the ITV crew and Kate and Frazer and their family which was a great opportunity for them to see the marquee (albeit not quite finished at that point) and the way that the day would run. 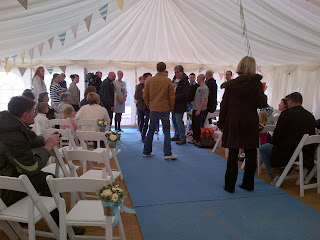 The bride and groom then enjoyed the evening with their guests before an early night as the day started very early! 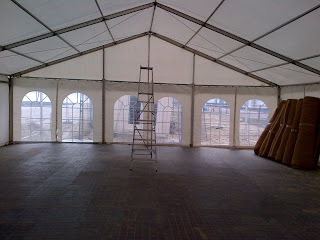 Down on site after the rehearsal took place we worked late into the dark of the night to finish the marquee. 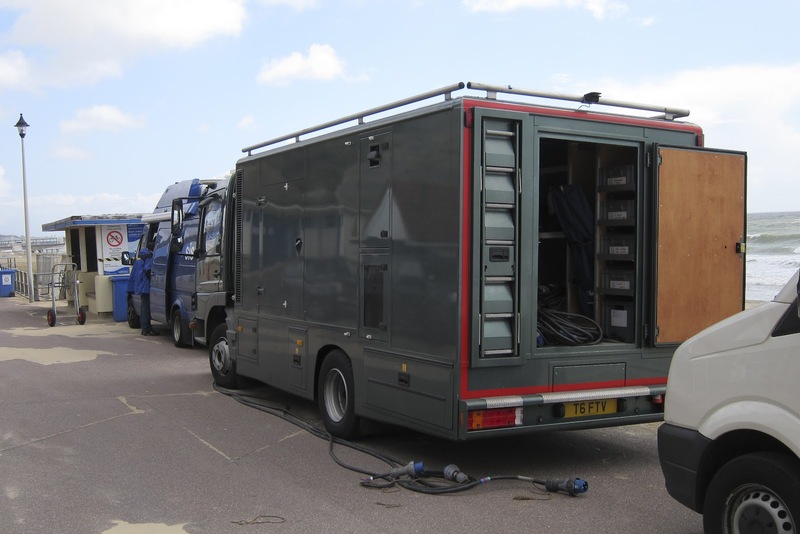 The catering team were arriving to set up the kitchen and deliveries galore were being made. What an exciting day of preparations this was but extremely hard work for all the team involved but so much excitement was in the air for the following day. Huge and heartfelt thank yous go to one of our biggest supporters IanH for working so hard on shooting some of these images above in the rehearsal and then went on to cover the wedding itself for Kate and Frazer – but more about that in Part II.